The astonishing novel Brave New World, originally published in 1932, presents Aldous Huxley's vision of the future -- of a world utterly transformed. Through the most efficient scientific and psychological engineering, people are genetically designed to be passive and therefore consistently useful to the ruling class. This powerful work of speculative fiction sheds a blazing critical light on the present and is considered to be Huxley's most enduring masterpiece. 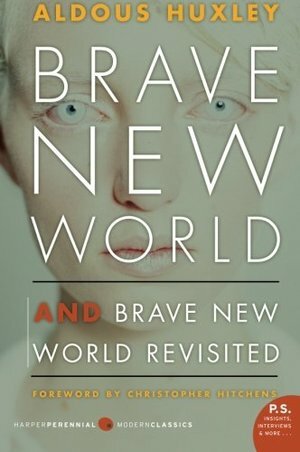 Following Brave New World is the nonfiction work Brave New World Revisited, first published in 1958. It is a fascinating work in which Huxley uses his tremendous knowledge of human relations to compare the modern-day world with the prophetic fantasy envisioned in Brave New World, including threats to humanity, such as overpopulation, propaganda, and chemical persuasion. публицистическое переосмысление автором своей антиутопии, футурологический анализ методов контроля над обществом со стороны диктатуры, плач ярославны по демократии. Must read!